Keep the sun and sweat out of your eyes with the Ronhill Air-Lite Visor. 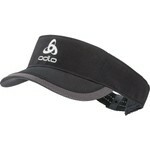 Made of Vapourlite technology, this running visor has an excellent moisture management system that will draw excess sweat away from the skin to help you stay dry and comfortable. The packable design makes it easy to carry in a pocket, folded into almost a nothing, always ready to be put into action!